The goal of this documentation and comments in the source code is to give enough information for other developers to understand how wpa_supplicant and hostapd have been implemented, how they can be modified, how new drivers can be supported, and how the source code can be ported to other operating systems. If any information is missing, feel free to contact Jouni Malinen j@w1..nosp@m.fi for more information. Contributions as patch files are also very welcome at the same address. Please note that this software is licensed under the BSD license (the one with advertisement clause removed). All contributions to wpa_supplicant and hostapd are expected to use compatible licensing terms. The source code and read-only access to the combined wpa_supplicant and hostapd Git repository is available from the project home page at http://w1.fi/wpa_supplicant/. This developers' documentation is also available as a PDF file from http://w1.fi/wpa_supplicant/wpa_supplicant-devel.pdf . wpa_supplicant is a WPA Supplicant for Linux, BSD and Windows with support for WPA and WPA2 (IEEE 802.11i / RSN). Supplicant is the IEEE 802.1X/WPA component that is used in the client stations. It implements key negotiation with a WPA Authenticator and it can optionally control roaming and IEEE 802.11 authentication/association of the wlan driver. The design goal for wpa_supplicant was to use hardware, driver, and OS independent, portable C code for all WPA functionality. The source code is divided into separate C files as shown on the code structure page. All hardware/driver specific functionality is in separate files that implement a well-defined driver API. Information about porting to different target boards and operating systems is available on the porting page. EAPOL (IEEE 802.1X) state machines are implemented as a separate module that interacts with EAP peer implementation. In addition to programs aimed at normal production use, wpa_supplicant source tree includes number of testing and development tools that make it easier to test the programs without having to setup a full test setup with wireless cards. These tools can also be used to implement automatic test suites. 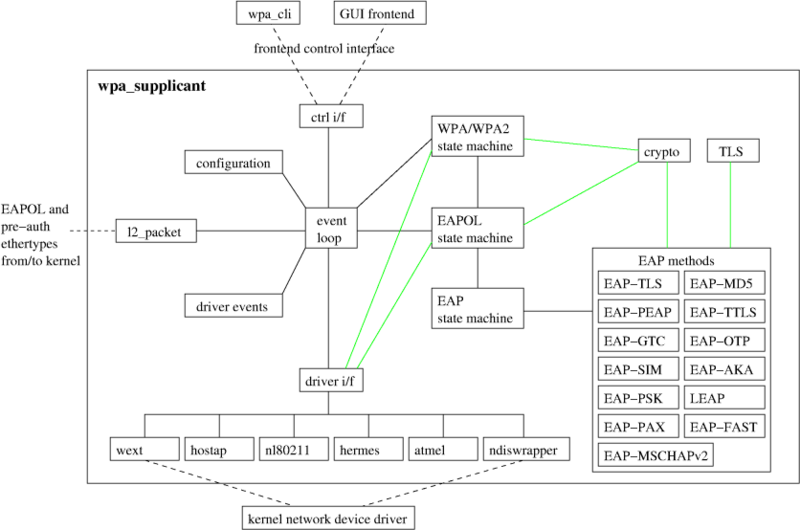 wpa_supplicant implements a control interface that can be used by external programs to control the operations of the wpa_supplicant daemon and to get status information and event notifications. There is a small C library that provides helper functions to facilitate the use of the control interface. This library can also be used with C++. hostapd includes IEEE 802.11 access point management (authentication / association), IEEE 802.1X/WPA/WPA2 Authenticator, EAP server, and RADIUS authentication server functionality. It can be build with various configuration option, e.g., a standalone AP management solution or a RADIUS authentication server with support for number of EAP methods. The design goal for hostapd was to use hardware, driver, and OS independent, portable C code for all WPA functionality. The source code is divided into separate C files as shown on the code structure page. All hardware/driver specific functionality is in separate files that implement a well-defined driver API. Information about porting to different target boards and operating systems is available on the porting page. 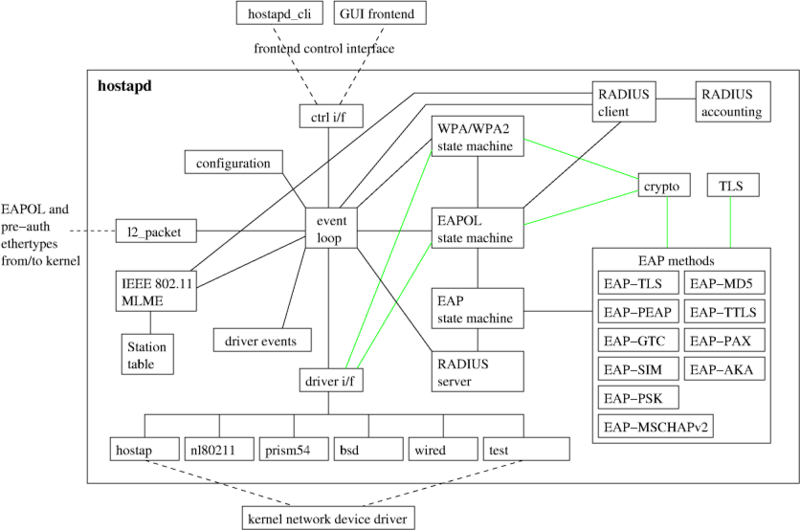 EAPOL (IEEE 802.1X) state machines are implemented as a separate module that interacts with EAP server implementation. Similarly, RADIUS authentication server is in its own separate module. Both IEEE 802.1X and RADIUS authentication server can use EAP server functionality. hostapd implements a control interface that can be used by external programs to control the operations of the hostapdt daemon and to get status information and event notifications. There is a small C library that provides helper functions to facilitate the use of the control interface. This library can also be used with C++.